"Behind the doorways".... a phrase that we hear about many Colonial period homes in San Miguel de Allende.... a phrase a truly applies to Casa Borealis. Borealis is a comfortable "oasis" in the middle of town. Combine with next door Casa Aurora (same ownership) and a family/larger group can have 10 bedrooms/11 bathrooms! Built in 1733-34, Casa Borealis is a house with character and style. One enters through a covered Zaguan in to the first of two courtyards planted with lush tropical plants, citrus trees and even a pomegranate! 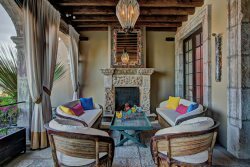 A covered outdoor seating area with fireplace and wet bar leads to the second courtyard with heated swimming pool and an ancient stone wall. front courtyard), dining room that seats eight and adjoining kitchen decorated with traditional Mexican ceramic tiles. The first floor powder room/pool bath has ceramic tile mosaics created in the 1950's by well known artist James Pinto (then an artist in residence at the Instituto Allende). Bedroom - twins can be pushed together to form a king size bed) and bathroom with an enormous tile bath tub/shower. bed (antique brass bed frame), vaulted boveda ceiling and private bath with shower. The second floor roof terrace has incredible views of the central San Miguel featuring the Parroquia and Immaculate (Las Monjas) churches, as well as wonderful views of the surrounding mountains and hillsides. Casa Borealis was recently renovated by new owners (architects/art collectors) who were careful to respect the Colonial integrity of this unique home. 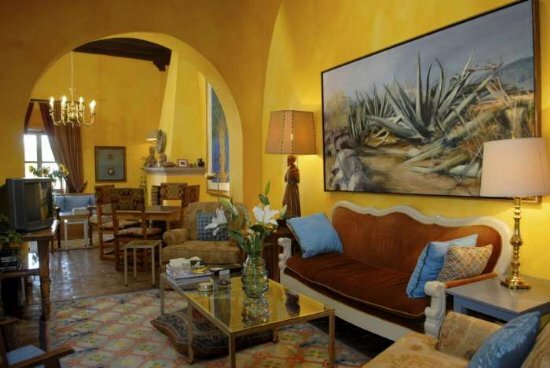 The comfortable rooms are painted in the vivid colors of Mexico - and carefully selected furnishings and artwork compliment the original architecture (thick walls, high ceilings, beams and special ceiling treatments). well and help to make your stay in San Miguel a wonderful experience (two maids and gardener).